Jacob, a young man from Indiana, designed an American flag for a school art project. What he did is going viral in a BIG WAY! Can you see what the fuss is about? MICHELE NASH-HOFF: "SAN DIEGO IS A HOTBED OF INNOVATION"
The other finalists were: Cubic Defense Applications for Halo Array, 3D Robotics for IRIS, Space Micro, Inc. for IPC7000, Image Processing Computer. This award shows that long-established company can still develop an innovative new product. Cubic Transportation System is “the leading provider of revenue collection management systems and services worldwide” and is one of three business segments of parent company, Cubic Corporation. Walter J. Zablefounded Cubic Corporation as a small electronics company in San Diego in 1951, and he remained involved in the management of the company as CEO until his death in 2012 at the age of 97. I started working at Cubic Defense when I was 19 years old for the Chief Scientist, Chief Physicist, and a Staff Engineer in the Marketing Department. The latter had previously developed the geodetic SECOR satellite surveying system, the first of its kind to produce a direct coast-to-coast measurement of the United States long before the Global Positioning System was developed. He was on the fast track for advancement and was promoted to Marketing Manager three years later, and I moved up with him as his assistant at age 22. When I started my own manufacturers’ sales rep agency in 1985, both Cubic Transportation and Cubic Defense became customers for companies that I have represented over the years. The other finalists were: DVEO division of Computer Modules, Inc. for Ad+EAS Serter™ and Tricopian, LLC for FuelRod. In addition to the MIP award, the life science magazine The Scientist’s selected Organovo’s ex Vive 3D human liver tissue for the seventh place spot of the top 10 innovations for 2014. The other finalists were: bioTheranostics, Inc for Breast Cancer Index (BCI) and Edico Genome for DRAGEN Bio-IT Processor. The other finalists were: GreatCall for Urgent Care and Visual Mobility Inc. for SEENiX. The other finalists were: Bioness for Vector Gait and Safety System and Diazyme for 25-OH Vitamin D Assay for Clinical Chemistry Analyzers. The other finalists were: Intific for NeuroBridge 2.0 and Raken, Inc. for Raken. Electrozyme LLC for ProFit SE Real-Time Sweat Electrolyte Sensor – this is world’s first wearable personal hydration monitor that can asses assess fluid and electrolyte loss in a real-time non-invasive way to determine if it’s time to rehydrate, what to rehydrate with, and how much to rehydrate. The other finalists were: Bast Surf for Bast and Cardiff Skate Co. for Cardiff Skates. Solatube International for Solatube SkyVault Series – the patented technologies of the Sky Vault series combines breakthrough optics with progressive engineering to enhance light capture, focus light over greater distances, or spread light evenly throughout a space. I wrote about Solatube in the second edition of my book because they “reshored” by returning manufacturing from China to their plant in Vista at the end of 2011, partially because of the risk of intellectual property theft of their proprietary technologies, in addition to increasing costs and difficulty in managing their offshore manufacturing. The other finalists were: Blue Wave International, Inc. for ClearWaveAir and Measurabl for Measurabl. Two other awards were given at the event: CONNECT’s Distinguished Contribution Award for Life Sciences Innovation was awarded to philanthropist T. Denny Sanford received, and the Distinguished Contribution Award for Technology Innovation was awarded to Dr. Robert S. Sullivan, Dean of the Rady School of Management, University of California, San Diego. From inventors being educated and mentored through the San Diego Inventors Forum to entrepreneurial teams developing technology based products being assisted and mentored through CONNECT’s Springboard program, San Diego is a hotbed of innovation. “Since the inception of the program in 1993, more than 3000 scientific and technological breakthroughs have been guided through the process of innovation to commercialization. Together, these companies have raised over $ 1.4 Billion in capital.” To me, this makes San Diego the “Silicon Beach” of California. In the spirit of patriotism, convention-goers can buy wooden flags handcrafted by combat veterans at the 2016 Republican National Convention underway in Cleveland, Ohio. 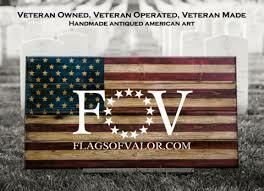 Flags of Valor—a veteran owned and operated company—is one of 22 vendors showcasing their product at this week’s event. Air Force veteran and President of Flags of Valor Brian Steorts said he got the idea for the company after being injured while deployed. He joined the FOX Business Network’s Maria Bartiromo to share his story. Steorts said he’d never done woodwork before, but picked up the trade by watching ‘do it yourself’ videos of painting and distressing. After it became a passion for Steorts, he says he launched the Virginia-based company to offer jobs to veterans. 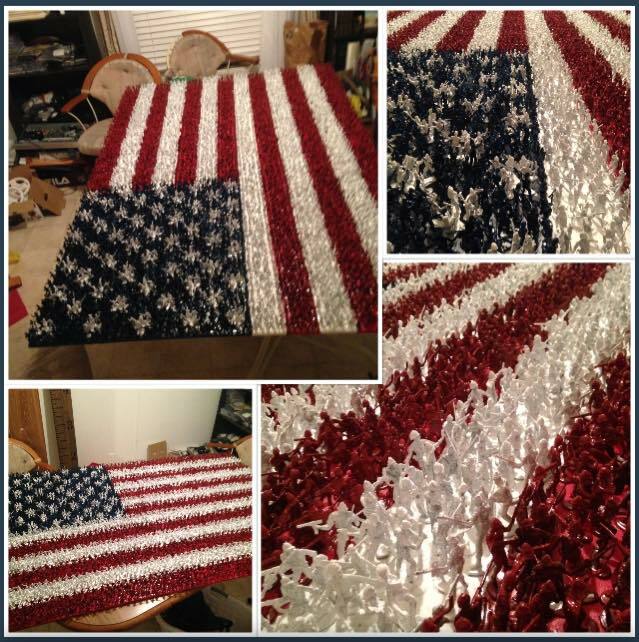 Flags of Valor now employs five other combat veterans and sells handcrafted U.S. flags named after specific groups of people or military events. When it comes to hiring, Steorts said he advocates for veterans because they thrive in the workplace. Steorts said he hopes to spread that message and share his love for America at this week’s convention. Kyra Zuck of Prairie Village, Kansas donated these Hyer boots. She spotted them on the Internet and purchased them because they had several well-known Kansas emblems, including wheat, sunflowers, and jayhawks. Inventing the Cowboy BootTradition credits Charles Hyer as one of the first to invent the cowboy boot. Company promotional materials state that a Colorado cowboy stopped by the Hyer shop on his way home from the Kansas City stockyards in 1875, requesting a new pair of boots that were different from his Civil War-style boots. He wanted a boot with a pointed toe that would slide more easily into a stirrup, a high, slanted heel that would hold a stirrup, and a high top with scalloped front and back so he could get in and out of his boots more easily. Charles accepted the challenge. The unknown cowboy was so pleased with Hyer's work that he returned to Colorado and told others about his new boots. The brothers employed mostly immigrant craftsmen from Germany, Sweden and Poland during the early years. They made cowboy boots for cattlemen, rodeo performers and movie stars such as Buffalo Bill Cody, Tom Mix, Will Rogers, and Gene Autry. To reach potential customers further west and across the ocean, the company created mail-order catalogues with measuring charts. During World War I, the Hyers made boots for the officers at Fort Leavenworth and at Camp Funston. In 1961, governors from the 49 other states were outfitted with Hyer boots courtesy of Governor John Anderson. They were presented as part of the traditional exchange of gifts between governors during the annual Governor's Conference. A Changing WorkforceBetter opportunities for immigrants and a changing workforce meant that the Hyer company had to adapt. As early as 1911, the Hyers lamented that fewer young people were entering shoemaking apprenticeships, which meant that they had to hire unskilled laborers and adjust the work accordingly. They were able to maintain the quality of their boots by having each worker complete one aspect of the boot making process, as opposed to assembling a boot from start to finish. This strategy allowed the Hyer Boot Company to remain competitive for several years. In 1977 the Hyer name was sold to the Ben Miller Boot Company of El Paso, Texas. Despite the official end of approximately 100 years of boot making, the tradition continued at the Olathe Boot Company which hired several former Hyer employees and purchased some of the Hyer equipment. The Olathe Boot Company was founded in 1975 and is still in operation. Today, many examples of Hyer products can be found in the Kansas Museum of History collection. The pictured black 19th century boots are on display in the museum's main gallery. In addition to Hyer boots and shoes, the collections also include patterns, lasts, and boot making equipment, as well as photographs of the owners and the employees. WALL STREET JOURNAL: "U.S. MANUFACTURING REBOUND LAGS BEHIND WORK SENT ABROAD"
Stanley Black & Decker opened a plant in Charlotte, N.C., a year ago to assemble some power drills and other tools previously made only overseas. But that factory relies on parts and materials bought outside the U.S. The U.S. has continued to grow more reliant on imports from China and other Asian countries despite a much-discussed trend toward “reshoring” of manufacturing, a study by the management consulting firm A.T. Kearney Inc. shows. Some pundits and consultants in recent years have heralded the potential for the U.S. to regain many of the manufacturing operations sent overseas in the past two decades in search of lower costs. A variety of companies, including Whirlpool Corp. and General Electric Co. , have moved production of some items back to the U.S. The A.T. Kearney study, to be released Monday, illustrates the gap between hopes raised by these scattered developments and the reality of a deteriorating U.S. trade performance. Reshoring “is not what it’s cracked up to be,” the report says. “There’s basically still more stuff being pushed out [of the U.S. to lower-cost countries] than is brought back,” said Patrick Van den Bossche, a Washington-based partner of A.T. Kearney. Even so, he said the U.S. is gradually becoming more competitive in manufacturing, partly because energy costs are lower than in most other countries and the gap between U.S. and Asian wages is narrowing. Companies also can reduce shipping costs and respond faster to shifts in demand if they produce closer to their customers. “I think we’re definitely on an upward trend in terms of U.S. competitiveness,” he said in an interview. That trend doesn’t yet show up in the data, however. In 2009 through 2013, U.S. manufacturing output grew by an average rate of nearly 6% a year as the nation recovered from a steep recession, the study found. But U.S. imports of manufactured goods from China and other low-cost Asian countries grew even faster, at an average rate of 8%. The study tallied imports from China and 13 other Asian countries, including India, Vietnam and Thailand. It excluded Japan and other higher-cost countries. One big hurdle for efforts to move production from Asia to the U.S. is that American manufacturing expertise and supplier networks have withered. Stanley Black & Decker Inc. opened a plant in Charlotte, N.C., a year ago to assemble some power drills and other tools previously made only overseas. But that factory relies on parts and materials bought outside the U.S. When ForeFront Product Design LLC of Pittsburgh introduced its Green Gorilla battery-powered spray pump for pesticides and other liquids, the company initially used brokers to arrange for the product to be made in China. Later, the founders grew nervous about relying on faraway suppliers. So they brought production to the Pittsburgh area in 2013. Still, several of the most critical parts—including pumps and lithium-ion batteries—still are made in China, where they are cheaper. Mr. Van den Bossche of A.T. Kearney said companies considering moving production to the U.S. often worry about finding enough suppliers and skilled workers. “They’re looking for an ecosystem to plug into,” he said. The U.S. dollar’s recent strength is another hurdle. The dollar was generally on a declining trend from early 2002 through 2013, losing about a third of its value, as measured by the Federal Reserve’s major currencies index. That made U.S. products more competitive abroad. Since mid-2014, though, the dollar is up about 10%, making U.S. goods more expensive overseas and imports cheaper. U.S. exports of manufactured goods in this year’s first 10 months edged up 1.1% to $998.38 billion, while imports climbed 5% to $1.604 trillion.